It might have begun, as many things do, with Robert Moses—or a meme about him, anyway. This was in February 2017. Juliet Eldred, at the time a senior at the University of Chicago studying geography, cross-posted the meme into a popular Facebook group she’d made for sharing GIS and mapping humor. 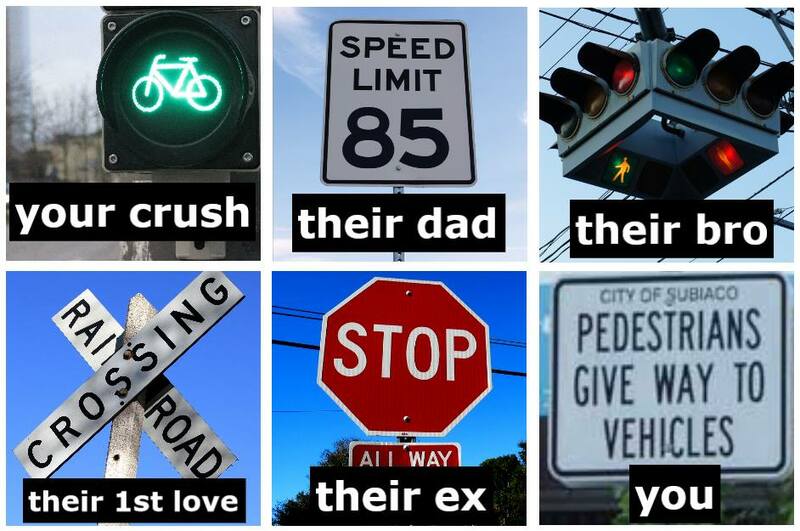 Within days, “New Urbanist Memes For Transit-Oriented Teens” was born. Actually, no: The original name for Facebook’s greatest fount of city-planning snark was “New Urbanist Shitposting.” Its current moniker—shortened to NUMTOT by those in the know—came soon after, as a handful of members began dunking on road-widening projects and comparing transit systems via meme. “It was not meant to be anything serious,” Eldred, who now works for a transportation consulting firm in Boston, said earlier this month. Yeah, but as they say on the internet: Life comes at you fast. One year later, the group has more than 62,000 members, with representation on every continent but Antarctica. The Transit-Oriented Teens seem to be mostly in their early twenties; there are undergrads and Ph.D. students, planning and GIS professionals, and pretty much anyone else who’s “gay for public transport,” to use a favorite NUMTOT expression. It is, in short, the premier social-media watering hole for young wonks who relish displays of high intellectualism disguised in low humor, and the endless potential for one-ups therein. “There’s something so striking about a meme that says, ‘bae come over,’ and it’s a photo of a train,” said Marty. Per Eldred’s estimation, the TOTs generate 100 to 150 posts per day. What gets shared nowadays are mostly news articles and links, but urban-y riffs on Thomas the Tank Engine, the peak performance guy, and the rest of the internet’s strange cast of meme characters are still in the mix. Including a lot of appreciation for transit. For those uncertain about what that humor is, understand that that’s part of it—a lot of memes are like inside jokes, produced by connoisseurs of a certain subject. With NUMTOTs, that subject is wonky. Take “New Urbanism” itself, a buzzy term for the 1990s movement promoting a return to dense, walkable design principles. In NUMTOT-land, the basic concept is all well and good, but the phrase—which is now often applied to suburban housing developments—is overused and clichéd. That makes New Urbanism, as well its foil in all things sprawling and car-related, ripe for irreverent commentary/shitposting. That may help explain the appeal of the growing group. As more young people move into cities, they’re curious about how cities work, succeed, and struggle, several members told me. Meanwhile, on university campuses, the number of city planning and GIS degree programs is also growing steadily. Young adults have more opportunities than before to get immersed in matters of bus ridership declines and contentious housing bills—topics the TOTs pry open and endlessly litigate, through memes and regular rapid-fire comments, often splitting into various political factions. A fairly tame, semi-comprehensible snapshot: This week, someone posted a Twitter thread about housing statistics in the Bay Area, with this caption: “It feels great knowing I'll probably never be able to afford to move back to the area where I grew up.” Another TOT replied: “sb 827 tho,” referring to the ambitious California senate bill proposing to unlock housing development near transit. Elsewhere, Marxists, market urbanists, and YIMBYs were arguing every facet of SB 827’s possible effects, civilly and otherwise. 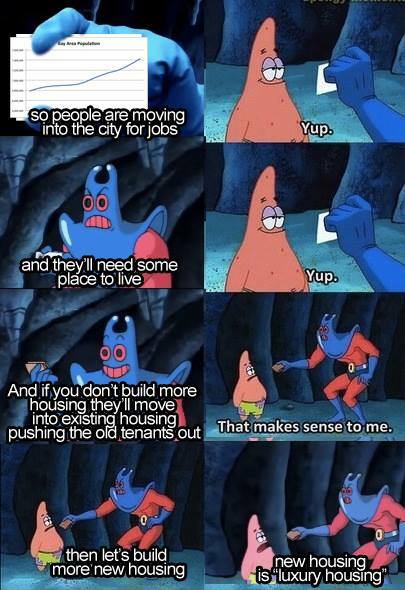 One member, Caleb Coggeshall, posted a trollish Spongebob Squarepants meme on the related topic of luxury housing that got 1,000 likes and 78 comments, mostly angry. “Build affordable housing with maximum income requirements, you rich diplord,” said one dissenting leftist TOT. Conversation can devolve quickly. And like in so many internet forums, the moderators have dealt with legitimately troubling discourse, including eruptions of racism. Last fall, Eldred politely requested that members compensate moderators over Venmo for the “sheer amount of emotional labor” required to fight the group’s more inflammatory tendencies. (A few people obliged.) “There have been times where it’s like we’re being asked to moderate the Israeli-Palestinian conflict in a group about, you know, trains,” Eldred said. She suspects the group won’t last forever—memes have a shelf life, after all. “Sometimes it’s like we’re asked to moderate the Israeli-Palestinian conflict in a group about, you know, trains,” Eldred said. Historically, the worlds of planning and transit have had trouble attracting younger people to their ranks. NUMTOT proves that that doesn’t have to be the case, Eldred said. If cities were staffed up with people who genuinely cared about the systems that make them tick—people as passionate about real trains as meme trains—surely they’d be better places to live.